But first, a note about those two articles published here this morning: As I hope many (if not all) of you guessed, it was a scheduling accident. In particular, as regards the piece “Russia’s Economy Is Now Europe’s Largest,” this is what I expected to see once the World Bank released its PPP-adjusted GNI figures for 2012 (it always does this in April, but for whatever reason it has been late this year). Russia is already very close to Germany as of 2011, and due to a planned harmonization of its GDP counting methodology with international standards – i.e. the introduction of imputed rent – it is projected to automatically increase by 5% in addition to its normal growth. Hence the title: It’s something that’s likely to happen, hence I wrote that title with “see data” for text and scheduled it for publication on April 30th, on the assumption that the World Bank will have released its new data by then and I’d have time to write the actual post. But the World Bank dallied and I forgot about the scheduled publication date. That is true enough if current trends continue. The operative word being “if.” But as I cautioned in my last post, extrapolating from a month or even a few months is a risky proposition, given the sharp seasonal swings in mortality. This is particularly true for extrapolations from winter months, in which there is an additional strong independent factor in the form of the influenza/pneumonia situation (which, on average, is worse during colder winters) and climatic factors (e.g. 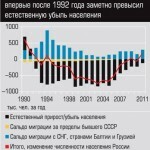 all else equal, Russians tend to drink more during colder winters). Now we know that this year’s has been exceptionally severe in Russia, so let’s look at the detailed breakdown for causes of mortality: -3% for infectious diseases, -1% for cancers and heart/CVD diseases, +18% for pulmonary diseases (e.g. pneumonia), no change in digestive tract diseases, -5% for deaths from external causes (but a +1% rise in alcohol poisonings), and +14% in deaths from sundry causes. Now on the surface this now looks quite a lot better. Despite a harsh winter, deaths from heart disease (the biggest killer in Russia) continued to decline, as did deaths from external causes (which disproportionately affect the young and thus have an especially negative impact on life expectancy). The additional 3,000 increase in deaths from pulmonary diseases will have mostly accrued to elderly deaths from pneumonia, most likely due to the season swings typical of its epidemiology. 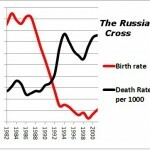 The major, overriding question is this: What are “deaths from sundry causes” (прочие причины смерти)? I don’t know. But we can speculate. In old age, it is frequently unclear which of a panoply of ailments finally do someone in. And harsh winters are associated with mortality rises, especially among the elderly. Perhaps a large part of that 7,000 rise in deaths from “sundry causes” were simply a result of more elderly dying due to general winter causes and not being precisely classified. In any case, I submit that three months is too short a time period to make any meaningful conclusions as to the final trajectory for the year. Again, I refer to Sergey Zhuravlev’s graph as a graphic demonstration of why that is so. 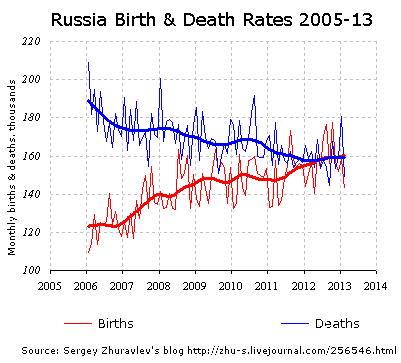 Russia’s improvements in mortality are not a steady process, to the contrary they look like a series of intermittent sharp declines followed by steady periods of up to a year’s duration. 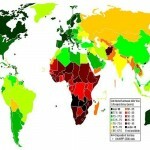 Then there is the decline in birth rates. To be fair, it is increasingly unrealistic to expect further rises in crude birth rates, because the “echo effect” is real (if often overstated, because of a failure to adjust for birth postponement/rising age of mother at childbirth). 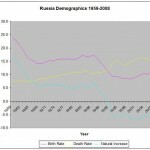 Russia’s total fertility rate started plummeting around 1991; the girls born then are now in their early 20’s. The average age of the mother at childbirth is now about 27 and rising, and up by 2 years since the 1990’s. Nonetheless, despite that counteracting effect, the fact is that the demographic “chasm” of the 1990’s continues to gain on women at their peak fertility (even if the age of peak fertility continues to increase) and it is a deep chasm, with women of the age of 5-19 making up just 61% of women of the age of 20-34 in 2012. So as there will be accumulating downwards pressure from changes in the age structure until the late 2020’s/early 2030’s we can now expect crude birth rates to start consistently falling from year to year.